This article is about the musical instrument component. For the speaking aid, see sounding board. 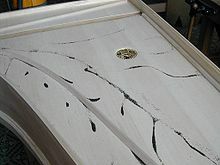 The upper surface of the sound board, depending on the instrument, is called a top plate, table, sound-table, or belly. It is usually made of a softwood, often spruce. The rear part, known as the back, typically does not contain sound holes and is made of a hardwood such as maple or pear. In a grand piano, the sound board is part of the case. In an upright piano, the sound board is a large vertical plate at the back of the instrument. The harp has a sound board below the strings. More generally, any hard surface can act as a sound board. An example is when someone strikes a tuning fork and holds it against a table top to amplify its sound. This page was last edited on 8 January 2019, at 14:26 (UTC).